Have you ever seen one Time Bomb? Well, Here's a collection of more than 1000!!!! Well, these are interesting seeds which explodes (or "pops" to be more accurate) after ten-twenty seconds when they're exposed to moisture. You should experience it to understand what I mean. But it's extremely difficult to collect so many. 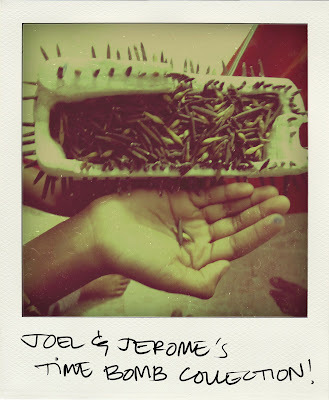 I'm bloody proud of my little cousin brothers Joel and Jerome, who had collected more than 1000 seeds (of two different species) in this season. 2)-Look at the boundary hedge of the nursery on the left when you're walking from Convo to Hospital. I would like to come down to kerala!